Across three experiments, we explored whether a dog’s capacity for inhibitory control is stable or variable across decision-making contexts. In the social task, dogs were first exposed to the reputations of a stingy experimenter that never shared food and a generous experimenter who always shared food. In subsequent test trials, dogs were required to avoid approaching the stingy experimenter when this individual offered (but withheld) a higher-value reward than the generous experimenter did. In the A-not-B task, dogs were required to inhibit searching for food in a previously rewarded location after witnessing the food being moved from this location to a novel hiding place. In the cylinder task, dogs were required to resist approaching visible food directly (because it was behind a transparent barrier), in favor of a detour reaching response. Overall, dogs exhibited inhibitory control in all three tasks. 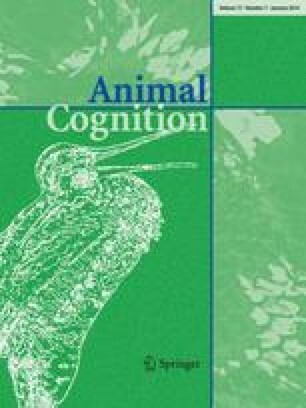 However, individual scores were not correlated between tasks, suggesting that context has a large effect on dogs’ behavior. This result mirrors studies of humans, which have highlighted intra-individual variation in inhibitory control as a function of the decision-making context. Lastly, we observed a correlation between a subject’s age and performance on the cylinder task, corroborating previous observations of age-related decline in dogs’ executive function. The online version of this article (doi: 10.1007/s10071-013-0633-z) contains supplementary material, which is available to authorized users. We thank S. Mitroff and A. Joh for helpful discussion, as well as J. Serpell, D. Cheney, P. Costanzo, M. Golonka, M. Ritchey, and two anonymous reviewers for their valuable feedback on drafts. We also thank T. Jones, A. Madison, Z. Best, and J. Clift for their help with coding, in addition to all members of the Duke Canine Cognition Center for help with data collection and testing. This work was supported in part by the Vertical Integration Program, the Duke Undergraduate Research Support Office, Office of Naval Research Grant No. N00014-12-1-0095, and National Institute of Health Grant 5 R03 HD070649-02. The experiments comply with the current laws of the United States.